BBC SPORT | Why do sportsmen cheat? A footballer admits to overstating injury. A rugby player chews a blood capsule to feign injury. A Formula 1 driver is told to crash into a wall. High-profile cases of cheating and gamesmanship have dominated the backpages in recent weeks, but why do competitors feel compelled to seek an unfair advantage? "People have and continue to do what they can get away with," says Andy Barton, a mental performance coach who has worked with numerous elite athletes across football, rugby, Olympic sports and other disciplines. "You can look back to the 1970s when drug taking in East Germany was pretty much the norm rather than the exception; the 60's and 70's when footballers were making career-threatening fouls week in week out; the early part of the century when marathon runners were getting away with jumping on cars or taking the tube and then claiming victory. Is gamesmanship and cheating increasingly rife in sport? "At the Moscow Olympics, officials opened the big doors at one end of the arena when the Soviet javelin throwers were taking their throws to improve the aerodynamics and then closed them for other athletes. "Boris Onishchenko [later dubbed Dis-onishchenko] was found to have cheated in the modern pentathlon's fencing event at the 1976 Games, rigging the electronic scoring system so that he scored without touching his opponent." James Lowther an FA tutor and British Association of Sport and Exercise Sciences-accredited psychologist at Kingston University, says cheating is also an almost inevitable bi-product of modern sports analysis. "In sport there is constant analysis of what others are doing, from using breathing strips to the effect of energy drinks," he says. "Coaches and analysts become aware of what can change a game, so that can even extend to things like seeing how players go down to win penalties." However, he is quick to point out that competitors must take responsibility for their own actions, adding that some people are willing to stoop to gamesmanship because of their "motivation orientation." "Competitors who are ego orientated [always comparing themselves to others] are prone to unsporting behaviour," he says. "This is often exasperated by a 'win at all costs' attitude in their sports environment. "Some people are motivated by external rewards and are more likely to cheat. Others enjoy the sport and self-improvement and that is their motivation." His view is mirrored by Mike McNamee, former President of the International Association for the Philosophy of Sport and the founding Chair of the British Philosophy of Sport Association and founding Editor of Sport, Ethics and Philosophy, who points to the example of the Spanish Paralympic basketball team. The champions from the 2000 Games, they were forced to give back their gold medals from 2000 after it came to light that 10 of their players had no disability. "Some are driven by glory and external goals," he says. "There is no incentive to cheat if you are committed to sport for its value, only when you are after external rewards that cheating comes in." McNamee, a Professor at Swansea University, adds that many incidents flagged up in the British press as cheating would not gain any attention abroad, where the focus is more on the actual harm done. Robin van Persie's revelation that he sometimes exaggerates his reaction to fouls was backpage news in England, but a similar quote may not be newsworthy in many nations. 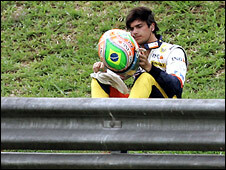 It is also interesting to note that, apart from bans for key personnel, Renault as a team effectively escaped censure for the Piquet crash, while Ben Thatcher initially only received a booking for a foul that left Pedro Mendes unconscious in hospital - he would have received the same punishment simply for diving. "It is a British phenomenon, we are imbued with Victorian values of playing the game 'fairly'," he adds. "Speak to people around the world and they might see play acting as OK. Many people would say what is the harm in some of these cases?" Many of the values may be peculiarly British, but Lowther argues they are not outdated. "Sportsmanship doesn't get lots of plugs, but there are unwritten rules such as throwing the ball back or calling fouls in snooker. These are ingrained," he says. "Sportsmanship norms are very strong in some sports, but being diluted on others. 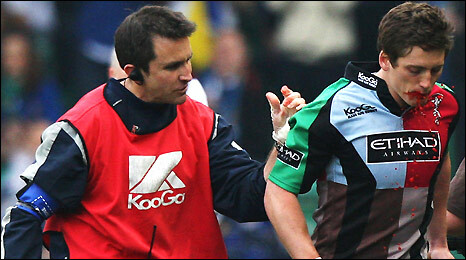 Rugby would have thought of itself as having a good image, that is why Bloodgate is so damaging as it has tarnished it." Although sports such as golf and snooker might seem to be above gamesmanship, Barton believes it occurs in all sports, only maybe with more subtlety: "You get snooker players who purposely slow a match down to frustrate an opponent, you get golfers who move about in an fellow competitor's eye line when they are putting. "When you put competitive people in a competitive situation, this is going to happen." So, it is a depressing situation. Gamesmanship exists, it always has done and, presumably, always will. Is there anything that can be done? Lowther argues that players are now actually more willing to bring cheating to light, Piquet acted as a whistleblower against his Renault team, while Tom Williams told a panel how he had been asked to feign injury by Harlequins during their Heineken Cup semi-final. "People are more secure that they can report it. These revelations used to just appear in their autobiographies 20 years later," he says. "Bans may not make behaviour better on their own. It's important for bodies such as the League Managers' Association to lead the debate and take ownership and come up with initiatives, rather than wait for edicts from Fifa and Uefa. "But we are seeing that governing bodies are more concerned with this issue, with the Football Association's Respect campaign a prime example." "Players have to take more responsibility, but also coaches have to reinforce it," McNamee adds. "For that to happen it has to be in their best interest. If you start being very tough and imposing rules it won't be long before someone tells their players to stop offending as it is hurting the team, but it has to start in the lower leagues so there is time for it to take effect." Ultimately, though, it might just need players to realise that it is in their own best interests not to cheat. "A lot of gamesmanship is counter-productive," Barton says. "I encourage my clients to get up from hard tackles rather than feign injury, partly because they look more intimidating if they look unaffected by provocation and partly because officials hate to be duped and if you get a reputation for milking fouls, you are less likely to win the free-kicks and penalties. "Interestingly, Didier Drogba seems to have been encouraged to do the same for Chelsea recently and is now staying on his feet, getting up when he is tackled and is probably winning more free-kicks as a result." But if gamesmanship does continue to dominate headlines, maybe we should just accept it as part of the game. Lowther mentions incidents from the 1960s and 70s such as Leeds' roughhouse tactics, Barton recalls John McEnroe's gamesmanship, while McNamee states that the first recorded cheating was in Homer's works from Ancient Greece. As Barton says: "There has always been and will always be gamesmanship. "The perceptions of gamesmanship are likely to be cyclical and the forms of gamesmanship may change but it will always happen. "For, instance, it is unlikely that any rugby player is likely to carry a fake blood capsule around in his sock in the near future, but the gamesmanship may take a more subtle form." Religion & Ethics - What is sport?